CAMBRIDGE, MASSACHUSETTS - On Sept. 20, Prime Minister Abe Shinzo was soundly re-elected for a third term as president of the ruling Liberal Democratic Party. As many have noted, this victory is historic because it puts Abe, who has already led the country for nearly six consecutive years, on track to becoming Japan’s longest-serving prime minister. The current record for the longest continuous prime ministerial tenure is held by Eisaku Sato, who governed for about seven years and eight months from 1964 to 1972. While Sato led Japan under very different circumstances, comparing his prime ministership to Abe’s offers interesting insights into what it takes to create enduring leadership in Japan. This is especially relevant given that the country has been otherwise known for its weak, short-lived governments — the average tenure of a prime minister since 1945 is only about two years. One commonality between Sato and Abe immediately stands out: They are related. Abe is the grandson of Sato’s older brother, Nobusuke Kishi (also a prime minister). Yet there are more interesting parallels between the two prime ministers that suggest a guide to durable leadership in Japan. First, position yourself well within a factionalized party. Sato’s premiership was stabilized by the deaths of several top rivals in the LDP. The politician, famed for his personnel decisions, shored up his administration by recruiting talent but never allowing it to undercut him. Though changes in institutions and the media have strengthened executive power since Sato’s time, the LDP’s factionalism remains very much alive. Rising to prominence in his 50s, Abe stood out in a group of aging LDP heavyweights. While some of his appointees have not been successful, he has leveraged powerful allies, including potential challengers such as Fumio Kishida, who served as his foreign minister for almost five years. Abe’s firm grip on the LDP organization is demonstrated by his ability to engineer a revision to party leader term limits (set after Sato’s long tenure) to allow him to run for a third term. Second, get close to America’s leader, preferably on a personal level. 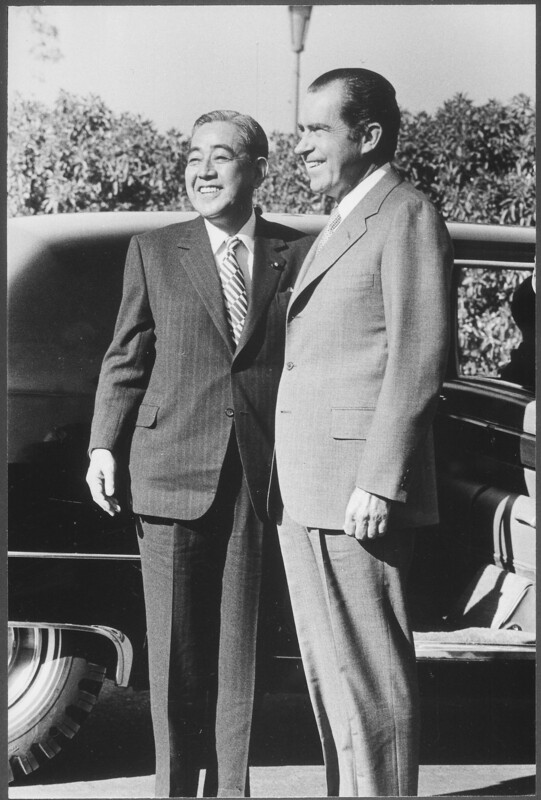 The very first thing Sato did when he assumed the top office in November 1964 was quickly establish a rapport with U.S. President Lyndon Johnson. 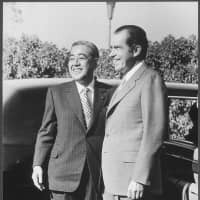 Over the years, he continued to emphasize top-level bilateral summits, which were key to achieving his goal of reverting Okinawa from American control to Japanese sovereignty. Similarly, Abe restored Japan-U.S. relations strained under the previous government and worked amicably with President Barack Obama’s ambassador to Japan, Caroline Kennedy. But the prime minister has been particularly helped by the election of Donald Trump. He lost no time appealing to a man who places outsized value on personal ties. Though Trump’s tariff policies have threatened Japan, Abe has benefited precisely because he has shown he is one of the few leaders with an ability to maintain a friendly relationship with the unpredictable American leader. Third, promote a clear policy vision. From the beginning, Sato made the historic return of Okinawa to the homeland a centerpiece of his government, and this extended and arduous diplomatic project gave his premiership a raison d’etre. The analog for Abe has been the cleverly marketed Abenomics, which generated enthusiasm after years of economic stagnation. While this agenda has received mixed reviews, there is also a measure of guarded patience informed by the upheaval and dissonance that characterized the previous administrations. In Japan’s parliamentary system, the longevity of a prime minister is primarily dependent on his ability to secure the confidence of most of the ruling party elite. However, a broader mandate is also important, for critics within the party will soon turn on a widely discredited leader to further their ambitions and even allies may pivot to save the party from electoral losses. Sato and Abe have been able to maintain the backing of a large segment of both the LDP and the electorate drawing on the three above-mentioned strategies. In Abe’s case, much of the popular support also stems from a loss of confidence in the 2009-2012 Democratic Party of Japan government and the complete disarray among the LDP’s competitors since that time. The prime minister may yet face real trouble to his position if there are new damaging revelations in the Moritomo and Kake political scandals. Furthermore, the 6-year-old Abe agenda is due for a reboot. Constitutional revision may animate activists and experts, but it is less likely to inspire the public. On the other hand, a real update to Abenomics — one that devotes serious, sustained effort to addressing Japan’s pressing imperative to globalize, innovate and marshal the potential of its women and diversifying population — would be a better bet. Taro Tsuda is a Ph.D. candidate in history and East Asian languages in the Department of East Asian Languages and Civilizations at Harvard University.